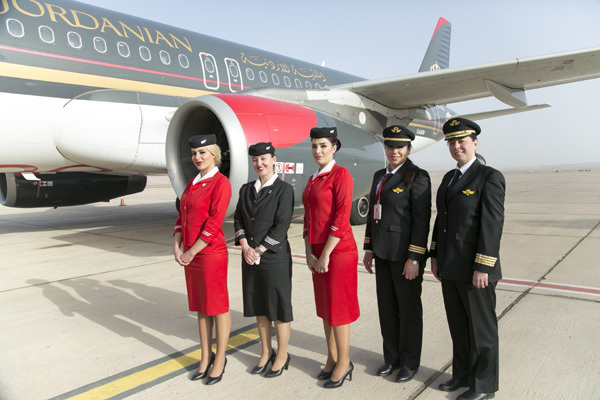 A Royal Jordanian flight on the Amman-Aqaba route was operated by an all-female crew on the occasion of the International Women’s Day, which is observed on March 8. The scheduled flight RJ300 was operated by Captain Hadeel Khamash and first officer Shireen Qatamin; the three flight attendants were Maysoon Jaara, Rinad Kawash and Walaa Issa. The passengers on board the A320 aircraft expressed admiration for this RJ gesture and thanked the airline for its support for working women and for helping qualify Jordanian women to fill different positions and play different roles in the aviation industry, which for a long time used to be an exclusive domain for men. President and CEO Stefan Pichler offered his congratulations to all Jordanian women in a short video posted today on all RJ’s social media channels and expressed pride in and appreciation for those who work for RJ for their input and help in attaining different achievements for the past 55 years since the company was established. Pichler said: “RJ spared no efforts in offering all the support to these women who played a major part in the progress of the company, investing in their competencies and giving them the opportunity to be promoted." “Women in RJ have played different roles efficiently; amongst RJ’s female cadre was the first female captain in the Arab world; today, there are three female captains and five first officers in the airline,” he said.